Hassan Jahangir’s Hawa Hawa is a Rip off(or Unofficial Remix) of An Iranian Tune? 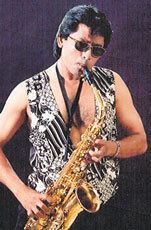 Hassan Jahangir’s “Hawa Hawa”, who made him a Superstar within nights in the sub-continent, in the late 80s, is now being reported as NOT HIS ORIGINAL SONG. The Song in question “Hawa Hawa” was first released around 35 years ago from now and it is actually an Iranian tune and NOT originally Hassan’s creativity, says a Video description that features an Iranian(persian) song sung by an artist named “Kourosh Yaghmaei”. It was in the eighties when Hasan Jahangirs terribly catchy Hawa Hawa came into music listener’s consciousness. Two decades later, Hawa Hawa hasn’t lost its appeal. Unfortunately, Hassan’s Hawa Hawa is one of many unofficial remixes of the song titled “Havar Havar” sung by an Iranian Singer named “Kourosh Yaghmaei”. After analyzing this situation, it seems like the tune “Hawa Hawa” or “Havar Havar” is one of the oldest pieces of poetry that has been covered through out by MANY Musicians in this region. Its similar to a situation like Kalaams of Bulleh Shah and Shah Abdul Latif that has been recited and sung by way too many poets, musicians and artists. Therefore, no one can claim ownership over these kind of content. But still, We must give credit to Hassan Jehangir on introducing this tune and music to the sub-continent. but! he shouldÂ have disclose this fact that he got inspiration for the song from an Iranian tune. We would try to retrieve Hassan’s stance over this, till then watch both versions “Havar Havar” and “Hawa Hawa”.